In the spring of 2013, WPI opened one of the most sophisticated fire science laboratories in the nation with one overarching mission: to enable researchers to set things on fire and study how they burn. Since then the Fire Protection Engineering Laboratory, located at WPI’s Gateway Park campus, has more than lived up to that promise. The facility, which actually consists of two laboratories, has played host to faculty and student researchers who are advancing the study of fire science by learning more about the burning characteristics of materials and structures, and applying their findings to help make the world a safer place. Nicholas Dembsey, professor of fire protection engineering, says the lab was a natural fit for WPI’s trailblazing Department of Fire Protection Engineering (FPE), which is home to the nation’s first master of science and doctoral programs in the field. The department is also a leader in research in such areas as fire dynamics, building design, and human response to fire-related emergencies. The FPE lab at Gateway is one of a few facilities of its kind in academia in terms of both capabilities and size. It has enhanced the unique nature of WPI’s FPE program by greatly expanding our research, project, and teaching potential. The smaller of the two, the Honeywell Fire Protection Engineering Fundamentals Lab, houses equipment for conducting micro- to bench-scale studies using small samples (up to about 100 millimeters on a side). Funded in part by Honeywell Life Safety, the lab can generate data on fundamental fire science variables. Researchers are often seen clustered around the state-of-the-art cone calorimeter, an advanced bench-scale instrument. The unit radiatively heats samples uniformly with electric coils located in its cone-shaped heater. The smoke is collected and analyzed in an exhaust hood with a connected duct. Researchers in the Fundamentals Lab also have access to a thermogravimetric analyzer that measures changes in the weights of samples as they are heated; a differential scanning calorimeter that measures temperature and heat flow associated with transformations like melting and crystallization; and a fire propagation apparatus in which samples are placed in a tube so environmental factors can be controlled. Over the past three years, WPI faculty and students have used this equipment for research ranging from improving the accuracy of wildfire modeling to generating biochar for wastewater treatment. Dembsey has also investigated burning properties of fiber-reinforced polymers (FRPs), composite materials such as fiberglass that are increasingly used in modern building construction. If drilling in the Arctic causes a spill, burning the oil may be the best way to clean it up. In pioneering research, Professor Ali Rangwala studied how ice and cold would affect oil burning, which led to a new technology that may improve the way we respond to spills in any climate. Critical burn tests were conducted in two-story Performance Lab. “FRPs offer a lot of advantages, as they are lightweight and low-cost yet strong and durable,” he says. “But we still need to learn more about how they react to fire." Working with graduate students and undergraduate student project teams, Dembsey has gathered fundamental data on the material properties of FRPs, evaluated the effectiveness of flame-retardant additives, and refined computer testing models that simulate the material’s decomposition. One project team also provided data for use in the construction of the largest FRP rain screen in the nation, located at the San Francisco Museum of Modern Art. The lab has also helped advance work by Ali Rangwala, associate professor of fire protection engineering, who is exploring ways to more efficiently burn crude oil as a means for cleaning up open water oil spills. Funded by $2 million from the U.S. Department of the Interior, the work began by exploring the challenge of getting oil to burn in the extreme cold of the Arctic, which holds large oil reserves. That led to the invention of a technology, called the Flame Refluxer, that increases burning efficiency by channeling radiative heat from a fire back into its fuel. Trevor Borth, who manages Rangwala’s Combustion Laboratory (located in WPI’s Salisbury Laboratories building), where part of the crude oil research is carried out, explains that the research began at the fundamental level, providing data on flame spread, heat release rates, and other qualities of crude oil burning that help develop increasingly accurate computer models. To test those models at larger scales, the research team heads to the UL Fire Protection Engineering Performance Lab, the second of the FPE labs at Gateway. 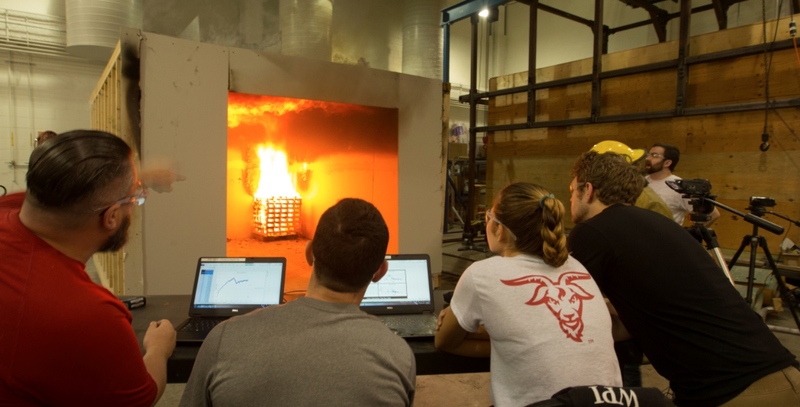 Funded in part by the UL science safety company, the 190-square-meter room features equipment and space for burning structures up to two stories tall. The FPE labs at Gateway are home to innovative research on a daily basis, from large initiatives to student projects and collaborations with industry. These facilities have truly been a game changer for WPI. The centerpiece of the lab is a 6-megawatt calorimeter that functions in much the same way as the cone calorimeter, but on a significantly larger scale. The calorimeter’s large hood, 6 by 6 meters, is located 6 meters above the floor. That creates a 6-meter cubic volume where assemblies of various configurations can be tested. With the lab’s controlled propane supply, researchers can create small- to very large fires that can be used to evaluate the reaction of assemblies to fires of varying intensities. “The space works well for large-scale burns because its air diffusers neutralize air currents, letting the fires behave naturally without wind effects,” says Borth. “For our crude oil ReFluxer project, we were able to scale up from a 10-centimeter burner to a 70-centimeter burner.” The team is now preparing for large-scale field trials at the U.S. Coast Guard’s Little Sand Island research facility in Mobile, Ala.
Dembsey notes that the lab is ideal for testing not only larger samples of materials, but also how those materials are structured. The Performance Lab will also play a vital role in a research project led by Brian Meacham, associate professor of fire protection engineering. The work is part of a study, funded by a $1 million award from the Department of Homeland Security, of fire performance of interior and exterior green building features. Meacham’s team recently constructed a large test rig that can simulate a two-story timber house. They will construct test structures within the rig using three different framing methods and expose them to fires of up to 4 megawatts in intensity to gather data on temperature, heat flux, and fire induced strains.